Movistar Yamaha MotoGP’s Valentino Rossi returned to the top rostrum today after a brilliant performance at the Circuito de Barcelona-Catalunya, celebrating his second victory of the season. Teammate Jorge Lorenzo suffered from a premature ending to the Gran Premi Monster Energy de Catalunya after a race incident caused by Andrea Iannone. 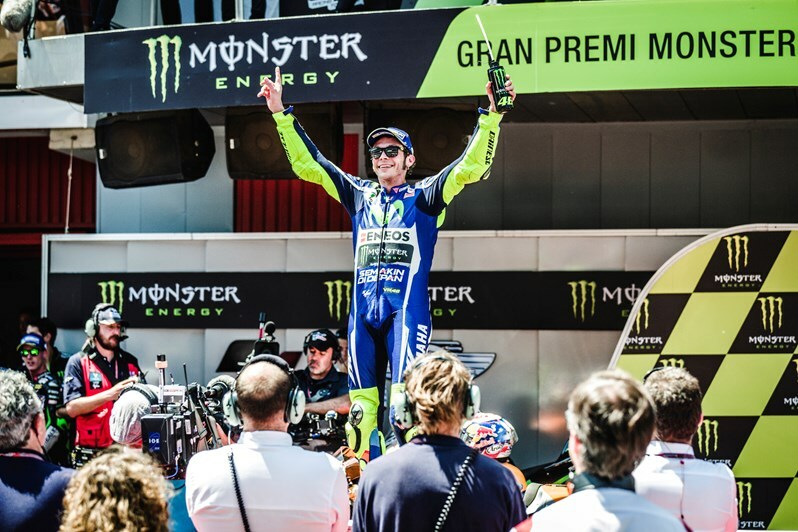 Movistar Yamaha MotoGP’s Valentino Rossi charged to an impeccable victory today at the Circuito de Barcelona-Catalunya, taking his second win of the season at the Gran Premi Monster Energy de Catalunya. Jorge Lorenzo also set a strong pace over the first stages of the race, but he was unable to hold his lead due to front tyre grip issues. Riding in fifth place, he was looking to take home vital points for the championship, until Andrea Iannone clipped him and caused a DNF for them both. Starting from fifth on the grid Rossi had his work cut out for him as he dropped back to eighth when exiting the first corner. The Doctor immediately put his nimble YZR-M1 to work and carved his way through the pack like a knife through butter. By the end of the first lap he had overtaken Hector Barbera and Andrea Dovizioso. Riding in sixth place as he crossed the line for the first time, Rossi moved on to his next targets, Maverick Viñales and Andrea Iannone. He overtook the both of them with a great manoeuvre and quickly passed Dani Pedrosa to earn a spot in the top three with still 22 laps remaining to reel in the front riders. As he pursued Marc Marquez, the Italian quickened his pace setting a fastest lap of the race so far. He soon reached the back of his rival’s bike and smoothly passed the Spaniard on lap six and swiftly moved on to pass his teammate to take over the lead on the very next lap. Now with a clear track in front of him, he put the hammer down, but he was unable to shake off Marquez, who was riding in second place. The end of the race saw a brilliant fight between the two key protagonists. The local rider made a move in turn five, but Rossi was quick to respond with a brilliant move in turn two a lap later. Marquez used the slipstream to find a way through again, but Rossi fought back. With two laps to go the Italian was in Marquez’ slipstream and needed no second invitation when the Spaniard left a gap on the penultimate lap in turn seven, allowing Rossi to make the race-winning pass. Marquez was unable to make up the lost time, while Rossi rode towards his second victory of the season, holding a 2.652s margin over the finish line. Lorenzo had a lightning fast start from second on the grid to take the holeshot. He rode the early stages of the race exactly as he had planned, increasing his lead to over 0.7s by lap two, whilst the 20 riders behind him tried to sort out their order. The Mallorcan rider pushed hard, but was unable to completely break away from Marquez in second place and his fast approaching Movistar Yamaha MotoGP teammate. He was forced to let the pair go past with 19 laps to go as he struggled to find grip on the harder front tyre. Lorenzo tried to make his Yamaha as wide as possible, yet Pedrosa also found his way past. He was then put under pressure by Viñales. A hot battle followed, with multiple overtakes from both riders, but in the end Lorenzo was unable to stick with his compatriot as the grip-level of his tyre was too deteriorated. The Spaniard then cleverly focused on collecting as many points as possible and was determined to keep Andrea Iannone at bay, but then disaster struck. Nine laps before the end Iannone ran into the back of Lorenzo’s bike whilst entering turn ten, thus ending the race for both riders. Rossi’s first place earns him 25 points. This result keeps him in third place in the championship standings on 103 points, now just 12 points behind Lorenzo in second position. “Until the start of the race it had been a very strange weekend because we faced many issues, first with the front tyre wear, then with the new track layout and finally with the tyre choice. The decision on the tyres was never a question because there was only one option for us, but when we tested the hard tyre in FP4, the riders’ feelings were not good at all, so we did not know what to expect from the race. “Our crew reacted in a magnificent way because they drastically revised the set up of both bikes, especially to make them suitable for T4, which was our weakest sector. “The race was another bittersweet one after Mugello. I’m almost speechless in front of Valentino’s supremacy on track today. I believe he’s written a new page in the history of this sport, winning at Montmelò seven years after his last victory here. He’s been able to recover from a less than perfect start that moved him back to the eighth place, and then he’s given the race a rhythm that was unmatchable for his rivals. “Jorge did a great start and led the race for six laps, until the front tyre dropped and he had to manage the attacks from Pedrosa, Viñales and ultimately Iannone. I believe Iannone has no excuses and, because it’s not the first time he causes such an accident, I expected the Race Direction to be more strict with him, as this incident could seriously compromise Jorge’s chances to fight for the title. Monster Yamaha Tech3 team rider Pol Espargaro produced a superb performance in front of over 100,000 passionate fans to seal the top independent position for the fourth time this season. The 24-year-old Spaniard kicked off his campaign from the 12 place on the grid and launched forward when the lights went out before closing the first lap in 8th. With the target being a strong finish in front of his home crowd, Espargaro quickly stuck into a formidable pace and he dived past the factory Ducati of Andrea Dovizioso two laps later. He continued pushing and was running in 5th with a third of the distance left to run, before meeting the chequered flag in this position, marking a positive close to the weekend for the Barcelona born rider. On the other side of the Monster Yamaha Tech3 pit box, Bradley Smith’s weekend came to an unfortunate end after withdrawing from the race six laps in due to a technical issue with the engine. The young Briton began the race from the fifth row of the grid and he undertook a solid start after taking the outside line into the first turn. However, shortly afterwards he dropped to the back of the field and then despite his best efforts he was forced to retire a few laps later. Today’s result marks a disappointing end to a tough weekend for the 25 year old, yet, after tomorrow’s test at the Catalunya circuit, he will seek to bounce back strongly at the Dutch Grand Prix in a fortnight’s time.